I finally planted the cucumber, tomato and chrysanthemum seeds which I bought many weeks ago. The seedlings of the cucumber and tomato have started to emerge from the soil on the fourth day, all thanks to Crystal's effort to water them every morning and evening. With much anticipation, we ain't see any seedlings from the chrysanthemum seeds probably the seeds are no longer good for planting. I will have to buy a few larger pots and some black soil to transplant the seedlings to allow more room for them to grow. Hopefully I can get some home grown cucumbers and tomatoes soon. Wishing all Kadazan Dusun friends a very Happy Harvest Festival, Kotobian Tadau Ka'amatan. Harvest Festival is celebrated in the whole month of May in Sabah as thanksgiving dedicated to the rice gods and invoke good harvest the following year. 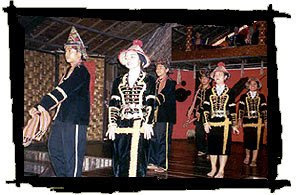 The highlights of the celebration would be on the 30th and 31st of May, statewide holidays in Sabah. Traditionally a thanksgiving ceremony, Magavau is performed by the Bobohizan or High Priestess, another highlight is the Unduk Ngadau or traditional Harvest Festival Queen contest. Tapai or home made rice wine is served throughout the carnival with music and cultural dances from daybreak till dawn. On our way to Melinsung Summer Bay Resort, Papar, yesterday morning, our car petrol indicator light started to blink. Whilst busy talking, Clet drove passed several petrol stations without realizing it, finally he stopped at the Lok Kawi Petronas petrol station to fill up the tank before we proceed our journey. After filling up the tank, he came back with a smile and handed to me the bill and two KFC discount vouchers. He knows I love discount vouchers. 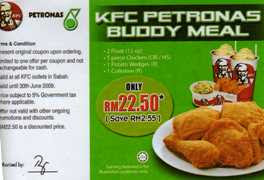 It’s the KFC Petronas Buddy Meal voucher where you are entitled to buy a meal consist of 2 floats, 5 pieces chicken, 1 potato wedges and 1 coleslaw for RM22.50 (normal price is RM25.05), with a discount of ONLY RM2.55, sad to say companies like KFC and Petronas join effort can only offer their customers with this tiny little discount. But a lot may say RM2.55 is better than none. What do you think? To save time on preparing and cooking , especially on working days, I usually think of the simplest way to serve dinner on the table before our girls start digging the fridge for food. It will tend to spoil their appetite if they have some snacks just before dinner time, to avoid that I have to prepare our dinner superly fast. One way to do it is to use ready packed paste whereby I just need to add in chicken or meat or fish and some vegetable to the sauce, usually only requires few steps to come out with a dish. I used the Maggi Honey Chicken Paste, it is a little spicy. I posted my version of the recipe here. I came across a very interesting online shop selling wide varieties of gifts ranging from mom agenda planner, monogrammed key fobs and monogrammed koozies, and many more other interesting gift ideas to choose from. I stumbled upon this site while searching for a gift for my niece’s birthday. Knowing that she is fond of fabric stuff, I am very happy to find this wrap monogrammed koozies 100% made in U.S.A for $15.75 as a birthday gift for her, I am sure she will be very delighted to receive it. It comes with a foam insulated koozies with stylish fabric shell. There are 39 different fabrics to choose from and the best thing is its personalised monogram embroidery, looks classic and style while sipping your favourite cold beverage wherever you go. The drinks will be kept cold for long as it is foam insulated. I chose the Large Pink Houndstooth pattern embroidered with a big letter R for my niece, which I find the pink is sweet and lovable by most girls. I also like the Baby Gate pattern which I am thinking of getting it for myself. Whoever knows me would know I am not quite an organised person, so a mom agenda planner would be a good organising tool for me to start getting organised! Right from the Sunday School, Crystal presented a card she coloured in the class and said, "Happy Mother's Day, God Bless you, mummy!" Here's the Mother's Days Special! that follows.